There's nothing like working feverishly to crack open a peanut knowing that your hard work will be rewarded. What lies inside the shell are some of the best tasting peanuts ever. Available in three sizes: 2 lb. bags, 10 lb. baskets, and 6 lb. boxes. ATTENTION: The plain roasted peanuts are roasted and shipped without any liquid cleaning of the shells. Therefore, the shells of those peanuts will often be off color (dark brown; black; multi-colored, etc.). Those colors are representative of the soil and weather conditions in which the peanut was grown. The peanut kernel inside the shell is perfectly ok to eat and is not affected by the color of the exterior shell. In contrast, both the salted and hot and spicy roasted peanuts are subjected to a liquid curing process. The water, in combination with the salt and other spices, creates a uniform shell color by removing the dark colors from the shells. I purchased a 2 lb. bag of the roasted salted peanuts at the Convention Center here in Greenville at the Holiday Show. My husband and I have never tasted peanuts as good as yours. We are addicted. The spicy in-the-shell peanuts are a family favorite. They are the best peanuts I've ever had, and they are the perfect level of spicy. The best spicy peanut ever can't stop eating them. The freshest, saltiest I have ever eaten. We (3 people)went through 25 pounds in just 2-3 months. Yummy! 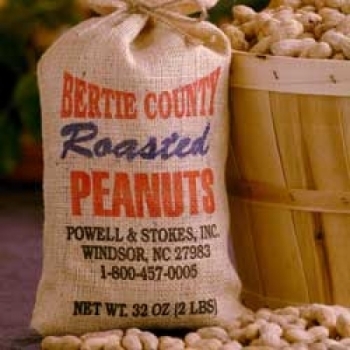 We purchase Bertie County Peanuts every year before the holidays because we and all of our guests enjoy them so much when they visit. Owner Response:Sorry to hear that you did not like the peanuts. However, we can assure you that they were this year's peanuts. In any event we will be in touch soon regarding our 100% guarantee. Owner Response:We're sorry to hear that. We ship all packages standard FedEx ground and the normal ship time to California is 6 - 7 days. So, it appears that despite the heavy Christmas work load, FedEx did the job they promised, and delivered the package before Christmas! have been searching for the right doneness for many years. I cannot not find roast dark enuf for my taste. I had to roast your nuts on 375 degree for 20 min more after buying them from you. ALLLLL of you nut companys are afraid to roast little bit darker. THEY all taste the SAME. Why don't you survey people and ask if they like darker roast. I had one company for 10 yrs, but they moved. They sold to every bar in Newark nj because we could not STOP eating them. Yours are NOT that good, they are under roasted. I will not return to u. Peanuts were very good and roasted just right. However were generally smaller than expected. Takes a while for us to go through ten pounds. But they are always fresh and tasty so, not a problem. Roasted peanuts were a disappointment in taste. They seemed not to be roasted long enough. 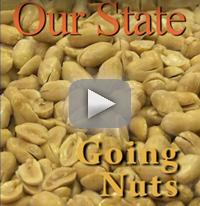 Owner Response:We're sorry you did not like the roasted peanuts. We only lightly roast our peanuts since there is a wide range of tastes out there. Some folks like them lightly roasted, other like them almost burnt. So by only lightly roasting them folks have the option of tossing them in the oven and roasting them to meet their personal taste choices. In any event we will be in touch regarding our 100% guarantee. I wanted this year's batch of peanuts; wanted fresh--not rancid--peanuts for the holidays--they are delicious--thanks!!! 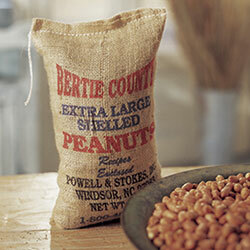 You can't go wrong with these tasty roasted peanuts. You can't buy fresh in the shell peanuts at the grocery store. These are great and very fresh! Very dissatisfied w/quality of product. Out of 2 handfuls I get 1 that has whole peanuts. Most are broken, too many empty shells and some smashed. I am using as party favors and now I'm running out of time. If I had known that I had to sort "gourmet peanuts", I would have never ordered online and instead I should have gone to the corner grocery store. I had great expectations. The value does not match the quality; quality or quality control is very poor. Owner Response:We're sorry the peanuts did not meet your expectations. We'll be in touch regarding our 100% guarantee. I've been buying these salted-in-the-shell peanuts to give to friends for Christmas for years and they always say they're the best they've ever had! Every year, the nuts come fresh and tastes fantastic! My order was not up to your past quality. They seem to be old. Owner Response:We apologize, and we'll be in touch regarding our 100% guarantee. 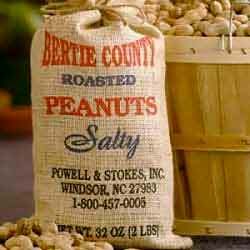 As a former Beaufort county resident I bought from your store frequently both raw and roasted. Moved to MI but still need my peanut fix. My recent 6# order of roasted is a disappointment. I'd have to say they weren't roasted long or hot enough and have that half raw half roasted flavor. My wife won't eat them without me having to shell and roast till they smell like ball park peanuts. I guess I'd have to agree with her. You guys missed the mark on this batch. Owner Response:We apologize. We have had problems with the plain roasted peanuts this year due to a poor growing season. We'll be in touch regarding our 100% guarantee. Have only tried a few and they have been great. These are by far the best peanuts I ever had. My first experience was from getting a bag as a gift, and i have been ordering them online ever since. It has been a pleasure dealing with such a great company. I have enjoyed these Peanuts since they were given to me as a gift last Christmas,and have been ordering monthly since for myself. Now it's Christmas time again, so I decided to buy a case to give bags to friends to enjoy.